Last week, I went to Legoland Japan in Nagoya. I’ll write about it in detail sooner or later, but in the meantime, I wanted to show you what I bought there. Of course, it goes without saying that there is a lot of Lego that can be bought. Actually, every section of the park has its own shop (sometimes even shops, plural) that tends to be thematic. For example, in the City section of the park, they’ll mostly sell City sets, etc. Now, I haven’t really visited any of these shops, because near the exit, there is The Big Shop, which is exactly what it says it is. It’s a very big Lego Store (the biggest I’ve been to, providing I’ve only been to three) that sells pretty much every single Lego set that is currently for sale. That, plus a few more various items. Honestly, I don’t really see the point in buying regular sets there; they’re actually more expensive than pretty much anywhere else. Still, the store is worth visiting for the things you won’t find anywhere else. And of course, I got a few of these things. Let’s start with the DC Super Hero Girls set. It was one of the two or three sets on sale (50% Off!!!) and as my daughter and I seem to be the only ones to like this series, I got it for her. Now I got to admit that while I genuinely love some sets from this series (Batgirl’s Batjet is awesome for example, I also like the dorm room sets), this set is not worth the regular price. This is why I hadn’t bought it yet, and why I jumped on it at half-price. 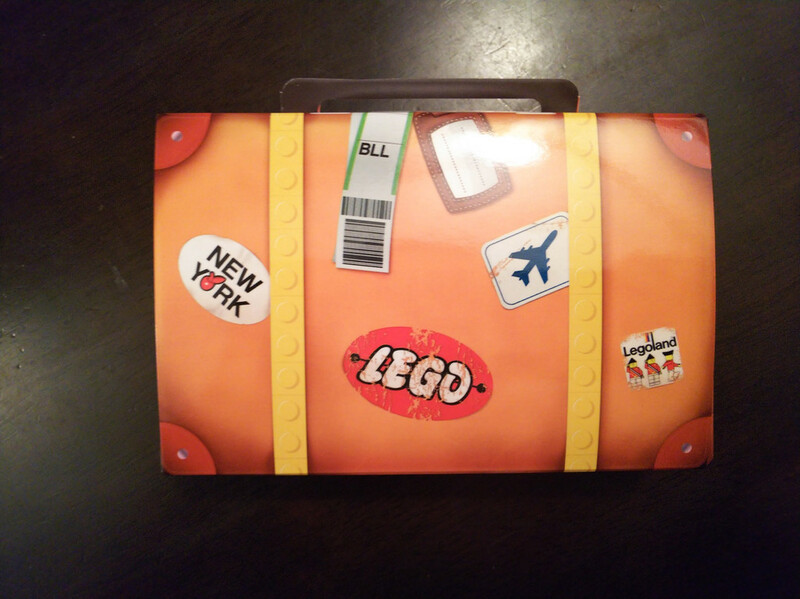 If we move to the bottom right corner of the picture, this is a Lego bottle for my kids. There were a bunch of other glasses, cups, etc. I also need to mention the stationery that’s pretty awesome. I regret not getting any, but I think one can find it online. I think that pretty much every Lego Store has a “build a minifigure” section. In Legoland, you can build them by three for about € 10. My daughter built the one of the left if you hadn’t figured. I told her that I have this body part (the black and pink top with a Lego skull on it) not once, but twice and that I can give one to her, but hard to have a five year-old think rationally when she’s in the process of imagining something. Of course, when building her minifigure she was not “planning” while that’s all I was doing. I didn’t really care for the final result, I was just picking parts that I didn’t already have and that I found interesting (those brown pants were a mistake, I should have picked some other legs, even though I don’t really have that many brown legs, actually). Note that while most parts come from the Collectible Minifigures series, it was not possible to build a complete one. For example, the Mime torso was available (it’s the first one I noticed), but his head was nowhere to be found. Of course, it’s on purpose. 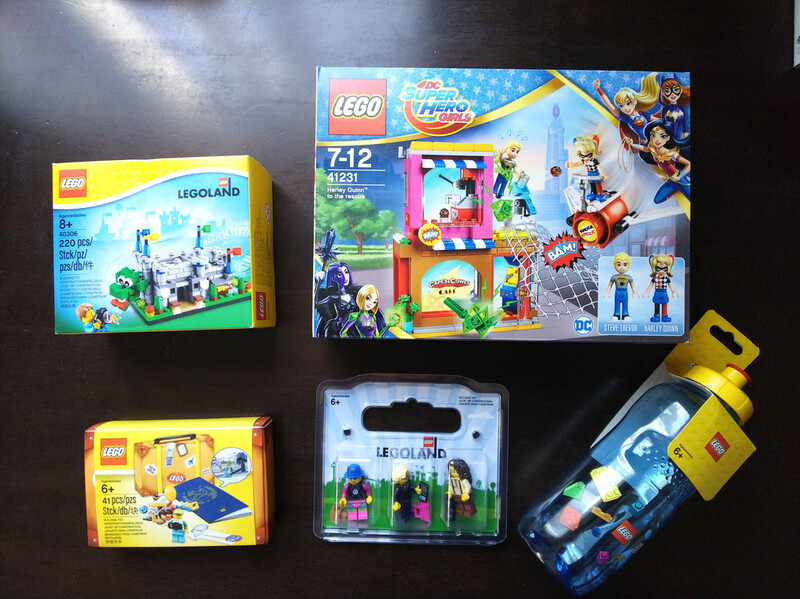 This set is one of the two exclusive sets sold only at Legoland (the other one is a small train). 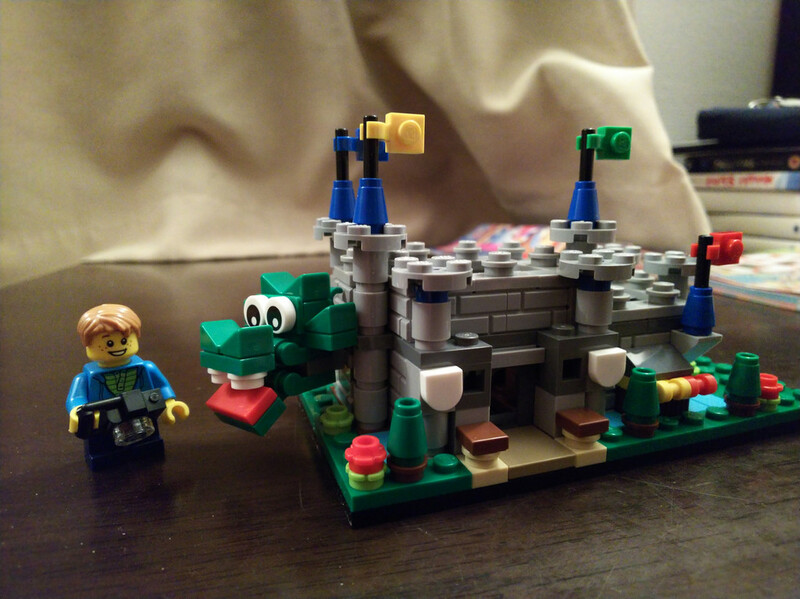 It’s a micro-scale version of the Legoland Castle. 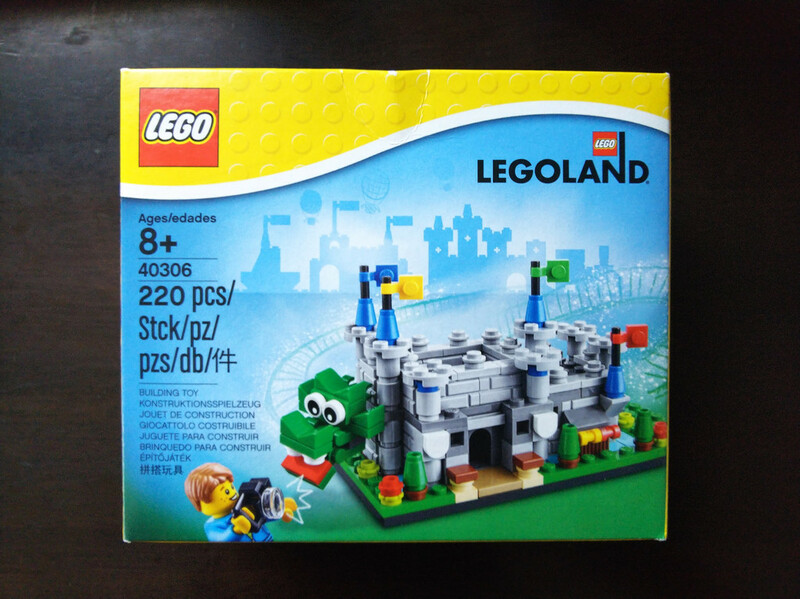 While, it’s not part of any series, just “Legoland exclusive”, I guess that if you really want to fit it in a series, it could belong to the Architecture one in a sense. And if you’re wondering why a dragon’s head is coming out of the castle, it’s because it’s actually a roller coaster. See, the roller coaster at Legoland represents a dragon and it comes in and out of the castle when you ride it. I find it to be a pretty cute set that was a quick and fun build. If you’re wondering the cost, it was roughly €20. 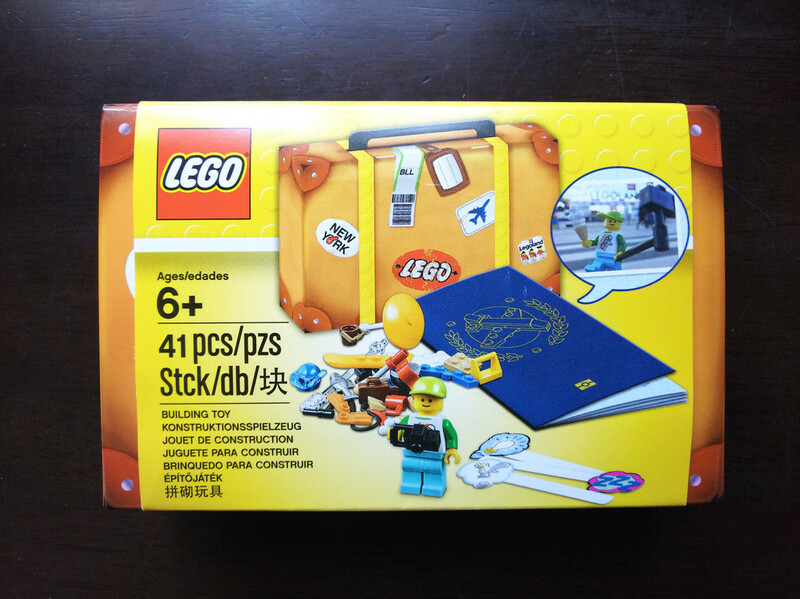 Also, a “passport” that’s really a short instruction manual for the two tiny builds (a barbecue and a lawn chair). 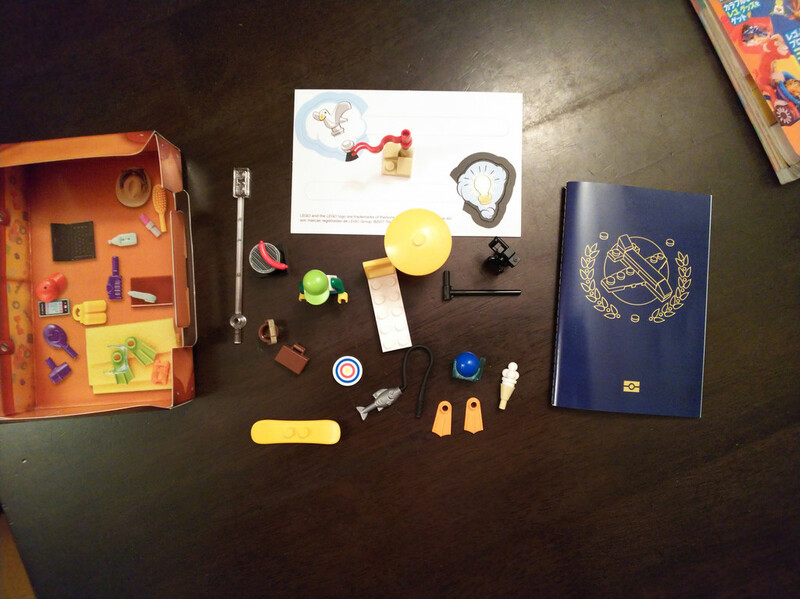 It also contains a bunch of pictures showing the minifigure in a bunch of real world situations with its accessories. 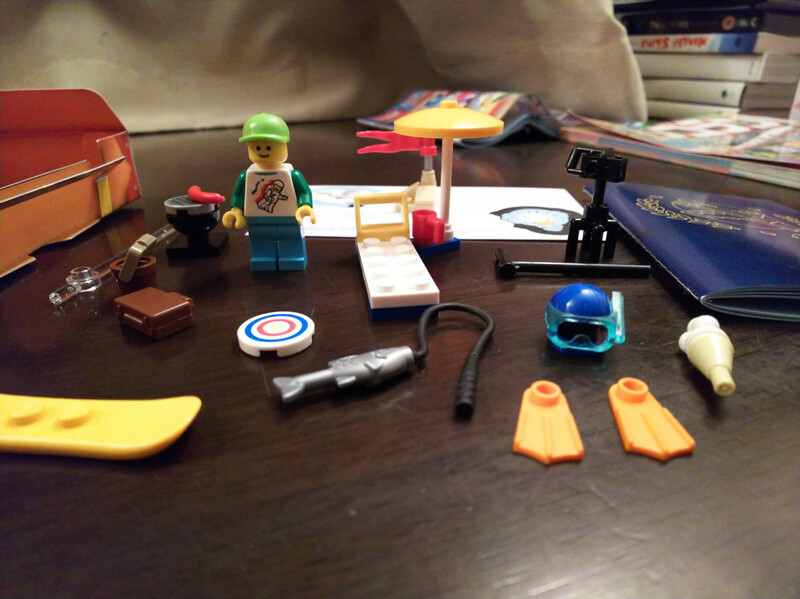 You know, things like the minifigure lounging on the chair in real sand, the minifigure fishing near real water, etc. In other words, this small set is to inspire kids (people?) 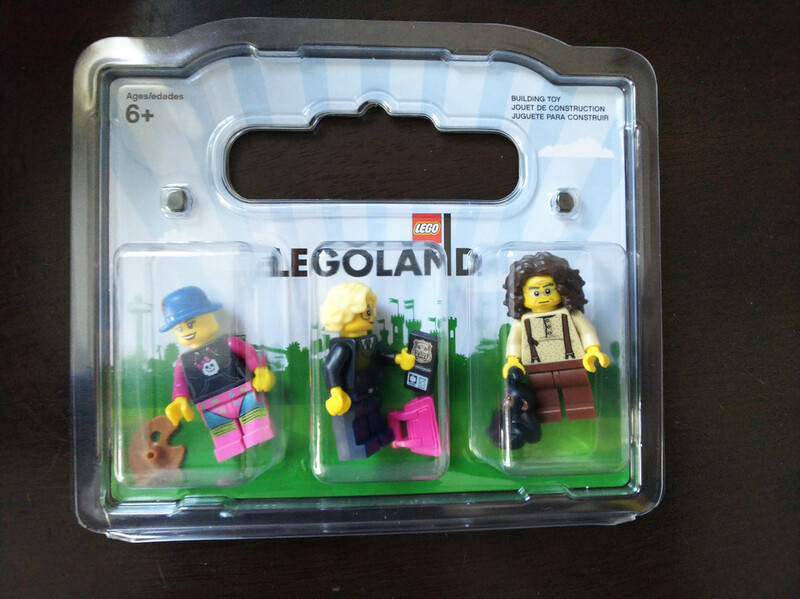 to bring their Lego outdoors and take pictures of them in various situations… Wait? So, basically what I used to do on this blog, but that I haven’t really done in quite a while? Yes, exactly that. I’m not losing hope though, I will take pictures of my Lego outside in the real world again, sooner or later. Now I even have accessories for it.